Implementing the DATA Act – The Center for Organizational Excellence, Inc. Since it was signed into law in May 2014, DATA Act compliance has a spawned a broad range of agency agendas that run the gamut from minimal effort to comply with an unfunded mandate to using compliance as a force multiplier on necessary transformations in agency business functions. Whatever your agenda is, you will need to develop a strategy that addresses your agency’s unique requirements, challenges, and business processes. Fortunately, there are actions you can take right now to dramatically improve your odds of success. In this paper, The Center for Organizational Excellence, Inc. (COE) shares the insights gained from 15 years of implementing government-wide data standardization initiatives to help you minimize the cost of compliance and maximize the value of your investment in data standards. As the nation’s first-ever open data law, the DATA Act is part of a larger imperative from Congress and the White House for agencies to get more sophisticated about how they gather, manage, and report data. To this end, the government is recruiting top digital talent to contribute to the dialogue, including developers, designers, and digital strategists from startups and top technology companies such as Google, Intel, Skype, PayPal, and Oracle. Ideas around ways to use data to improve efficiency and maximize effectiveness abound. The driving focus of the DATA Act, however, is to clear the first hurdle before any of that can happen – making the data available in a standardized, consumable format. This means that gaining an understanding of the current state of your agency’s data and your associated business processes is not enough. You must start using your DATA Act data. If you treat it like a compliance effort, you may get blind-sided by problems with the data that others discover when they go to use it after it is published on USAspending.gov. The other reason to start getting smart about using your data is that unused data is probably ignored data. And that means there’s a good chance that no one is paying attention to making sure the data is error free. Implementation may be disruptive. From procurement, grants, and financial systems, to program and contractor systems, the DATA Act’s impact will be felt throughout the organization. The implementation could be disruptive, both technologically and culturally, requiring coordination across multiple business functions within the agency. Additionally, because very little funding has actually been set aside for DATA Act implementation, agencies will need creative solutions for allocating their limited resources without disrupting other programs. The guidance provided to-date has been fluid and changing. DATA Act implementation guidance has been provided by Treasury and OMB through an iterative, inclusive, and transparent process. This is a deliberate strategy to include the providers and users of DATA Act information with an opportunity to participate in the standardization process. It has the benefit of delivering incremental progress, while allowing for frequent calibration and adjustment as pilots are conducted and data elements are tested. However, this means that data element identification, definitions, standards, and schema are not yet fully defined. You will need to develop a corresponding ability to quickly adapt and, if necessary, change course in response to new directives or guidance. No pre-determined roles exist to handle this initiative. Achieving alignment among key stakeholders is necessary to ensure the success of the program across multiple business functions and data owners who must all adopt and implement common standards. An important first step is determining roles and responsibilities, and agreeing upon ownership of major programs or tasks. Buy-in from your agency’s leadership is essential. You will need to take an open, honest measurement of the potential costs, time, effort, barriers, and impacts of this endeavor so that you can set realistic expectations. Planning for these challenges from the outset can reduce or eliminate stalled project phases due to unforeseen dependencies in other areas. How prepared is your agency? Do you have a detailed inventory of the data stored in financial, budget, payment, grant, and contract databases? Do you have a sense of how well the data you currently have matches up against required DATA Act elements? Are there data elements that just don’t exist in your systems today? Have you evaluated the strategic value of DATA Act compliance in terms of more efficiently and effectively accomplishing your agency’s mission through data-driven decisions? Have you identified stakeholders, roles, and responsibilities? Do you understand how your technology systems, processes, and workload will be impacted? Have you assessed your organization’s readiness and capacity for change? Have you identified skilled resources within your agency capable of implementing the required changes? Do you understand the key challenges, risks, and costs of non-compliance? If you were more likely to answer “Yes” than “No” to these questions, you are moving in the right direction to both comply with the Act and to achieve improved decision making for your agency — the real end game for agencies embracing the DATA Act. a flexible, adaptable process for achieving on-going compliance with data standardization specifications. sustainable cultural change within your agency driving increased data sophistication. leveraging your implementation investment to deliver lasting value, which is the standardized data AND how the data is used by your agency. The DATA Act requires an unprecedented level of data sharing and transparency across business functions, which in turn requires adequate controls and clear lines of authority. Governance specifies the decision rights and accountabilities for the way financial, procurement, and grants data are created, used, stored and secured. 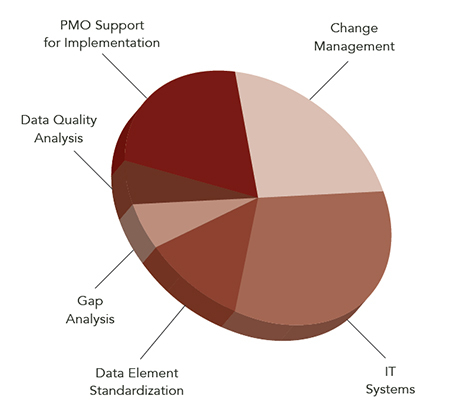 The primary goal is to clearly define the roles of everyone who will be involved in transforming and standardizing agency data, including the process for agreeing to new data standards and the associated policies, procedures, and measurement metrics. An outcome of effective data governance is improved quality, easier access, and managed and auditable securit – all critical to effective DATA Act implementation. Every agency has a variety of systems to capture activities related to budgets, financial systems, grants, loans, procurements, and payments. Complicating this is the existence of siloed sub-agency and sub-component systems and a mix of legacy systems and modernization efforts all co-existing within a single agency footprint. It is critical to begin planning with an awareness of the complexity of the existing systems and the change management effort required to align people and processes with the necessary changes in how data is managed. A successful change management initiative helps agency employees understand how data will be used, which increases data quality and the value of data in decision making. DATA Act implementation is most effectively supported with an agile methodology, which measures progress in short, iterative cycles. This engages stakeholders, demonstrates progress, and facilitates refinement of strategies and tactics. Uncertainty and risk is reduced by identifying what needs to be done, by whom, and when they need to do it. It also provides a basis for monitoring and controlling project work, as well as identifying and addressing issues before they become problems. A first step for all agencies is a detailed inventory of data stored in financial, budget, payment, grant, and contract databases, as well as any associated management systems that house performance data. Some data may not exist in a machine-readable format, while some data elements may have already been standardized across the entire organization. Once you have inventoried your systems and identified where data currently resides, you will need to assess the degree to which the data you have maps to the data elements and standards specified by OMB and Treasury. Tasks will include conducting a gap analysis between available data and DATA Act elements and estimating costs associated with compliance. You will need to identify pilot activities to test solutions for resolving identified gaps and gaining stakeholder approval. Evaluation will help you identify the system, policy, and process changes needed and reduce the risk of unexpected outcomes. To achieve success, agencies will need effective project management and the ability to adapt to evolving standards and shifting requirements. As discussed earlier in this paper, Treasury and OMB are using an agile approach to developing specifications for compliance, which requires agencies to build the capacity to make changes in short, iterative phases. Implementation support will also be needed to manage risk and execute change management and communication plans. A critical aspect of implementation is building the capacity of the agency workforce to use data to increase the quality of decision making. This may mean transforming a transaction-oriented workforce to be more capable of analysis, trending, correlation, and presentation. Monitoring and reporting encompasses a cycle of assessment, correction, and measurement undertaken by the agency designed to ensure the sustainability and health of the initiatives undertaken by the agency to comply with the DATA Act. Early identification of metrics that accurately reflect progress towards goals is essential. Otherwise, agencies risk making course corrections that solve problems that don’t actually exist or failing to identify and address real issues jeopardizing the initiative. Failure to understand the complexities inherent in DATA Act compliance will exponentially increase the quantity of resources needed to implement the necessary changes. Last minute, manual interventions needed to bridge gaps in meeting compliance requirements consume valuable resources. And experience has taught us that these point solutions will likely have to be repeated over and over again. An alternative approach is to assess your agency’s capabilities against the six critical skill areas essential to DATA Act implementation to help clarify where you need support. With this understanding, you will be able to build a realistic plan that anticipates the internal and external resources needed for success. Agencies will need capacity in 6 key areas to support implementation and on-going DATA Act compliance. 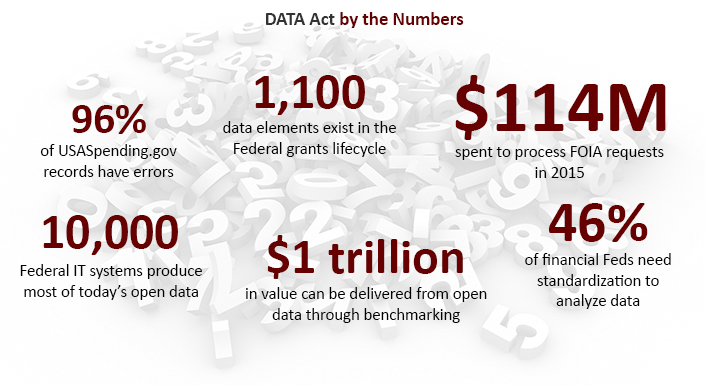 The DATA Act’s primary goal is to improve agency decision-making and performance through the availability and use of standardized data elements that describe government spending. The improvement may occur through pressure created by external stakeholders who can now access more robust spending data or the agency may act on it’s own. Agencies that shine in this era of unprecedented legislated fiscal transparency will be the ones who understand the value of DATA Act compliance. Their leaders will be the ones who strengthen agency business maturity by increasing their sophistication in managing and using data. Form inter-agency working groups. Many agencies have already formed inter-agency working groups, primarily around data governance. 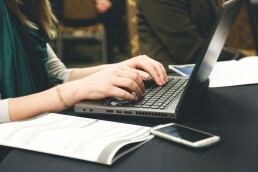 Agencies should also form working groups comprised of employees at any level who demonstrate the skills and abilities your agency will need to maximize the value of the available data. Shore up weaknesses to maximize outcomes. DATA Act implementation is a public-private endeavor. The call to government is to make data available and consumable. The call to industry is to innovate ways to use the data to deliver value. McKinsey estimates that there is somewhere between $3 trillion and $5 trillion in economic value that can be generated from open data. And at least a third of that will come from benchmarking – using data to identify variability, best practices, and efficiencies. Agencies can come out ahead on DATA Act compliance, but to do that they need to identify the resources they need to cross the goal line. And get help – from other agencies, Treasury, OMB, and industry – to make sure they have the resources they need to plan, execute and monitor implementation activities. Perhaps even more critical is having the skilled resources needed to exploit the newly available, standardized financial, procurement and grants data to identify opportunities to improve operations and more efficiently accomplish your agency’s mission. Get the conversation started about why your agency needs an experienced DATA Act sherpa to help navigate your way through the pathway to transparency! Lyn McGee has 20 years of experience developing and delivering data and internet solutions and leads Consulting Solutions for COE. Russell Huffman spent the last 15 years researching trends and issues for federal agencies. During his time at COE, Russ headed up COE’s capture management efforts.